On Whirlwind California Trip, Trump Tours Border Wall Mockups And Talks Military : The Two-Way The visit Tuesday marks the president's first to the state since taking office. Before addressing the troops, he swung by huge prototypes that may eventually fulfill his signature campaign pledge. President Trump views prototypes of his long-promised border wall in San Diego on Tuesday. The mockups, which are are still being assessed by officials, stand up to 30 feet tall in the borderlands region of California. President Trump is making his first visit to California since taking office, using the whirlwind trip to view prototypes for his signature border wall proposal and promote his defense policies to troops stationed in San Diego. 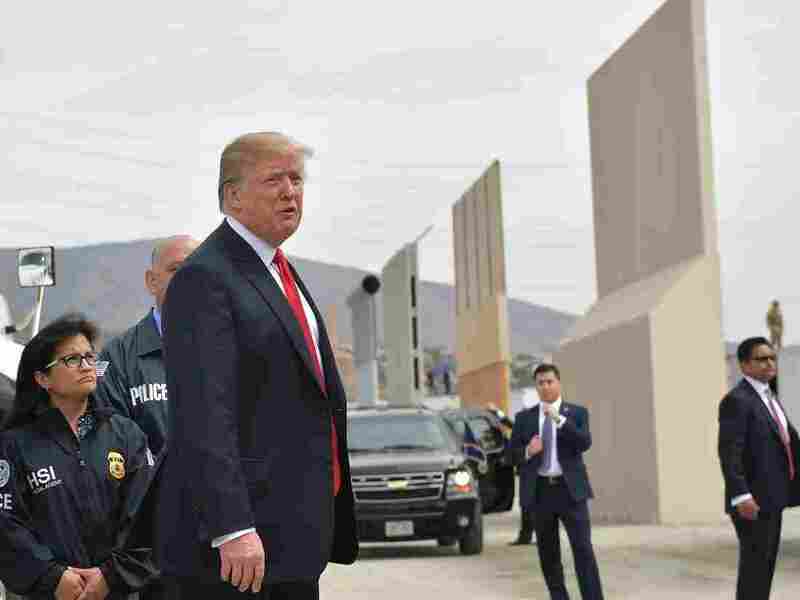 The trip Tuesday opened with a viewing of the eight options that his administration has selected for testing — and that might serve as his long-promised wall along the border of the U.S. and Mexico, if Congress decides to allot the funds to do so. "If you didn't have walls," Trump told reporters during his tour, "you wouldn't have a country." The president's arrival was awaited in the area by a cluster of police, chanting protesters and supporters clad in campaign gear, waving American flags. Also at the site, awaiting him in contrasting silence, are the roughly 30-foot mockups the Department of Homeland Security picked to give a closer look — four of which are solid concrete, while the other four are built of "other materials," including steel. Built by private contractors from across the country, from Maryland to Arizona, the prototypes have been funded with $20 million from Customs and Border Protection. Homeland Security Secretary Kirstjen Nielsen and several Border Patrol officials briefed the president on the ongoing assessment of the prototypes, the White House says, "with a focus on how the features and attributes of each impedes illegal crossings." Ultimately, the Trump administration expects that the whole border wall, when completed, would cost about $18 billion — though other estimates have ranged up to $38 billion. Despite a concerted effort from the White House and many GOP lawmakers, efforts to apportion that money have stalled in Congress, along with broader conversations around the Deferred Action for Childhood Arrivals and other immigration programs. Trump's campaign pledge to build a massive wall along the border between the U.S. and Mexico has proven just as divisive outside Capitol Hill. Just a day before Trump's arrival in California, the state's Democratic governor, Jerry Brown, called on the president to extend the focus of his visit beyond the wall. "You see, in California we are focusing on bridges, not walls. And that's more than just a figure of speech," Brown said in a letter to the president he posted publicly Monday. "After you've examined your wall prototypes on the border," he added, "I invite you to head north to the Central Valley — the heart of California. Here in cities like Fresno and Madera more than a dozen bridges are being built for the nation's first and only High-Speed Rail line." Others, such as San Diego-based immigration advocate Andrea Guerrero, see the president's proposal as an alarming symbol of the policies his administration has pursued. "The wall is more than a wall," she told NPR's Richard Gonzales before Trump's arrival. "In the shadow of that wall, a deportation force is growing and it is ripping families from one another. It is devastating communities well within the interior of the United States." During remarks to media Tuesday, Trump countered those fears by raising still others. "There's a lot of problems in Mexico — they have a lot of problems over there," he said. "The fact is, if you don't have a wall system it would be bedlam, I imagine." Later, he stopped in at the nearby Marine Corps Air Station in Miramar, addressing an often-boisterous crowd — and promoting what he called "the largest military buildup since Ronald Reagan and one of the largest buildups we've ever had in the history of our nation." Among other things, the president promised the assembled members of the military their "largest pay raise in over a decade," brand-new warplanes and and a national strategy that "recognizes that space is a war fighting domain — just like the land, air and sea." "We may even have a 'space force,' " he added. "Develop another one: We have the Air Force, we'll have the space force." He is expected to wrap up his day in Los Angeles with a fundraiser later in the evening.